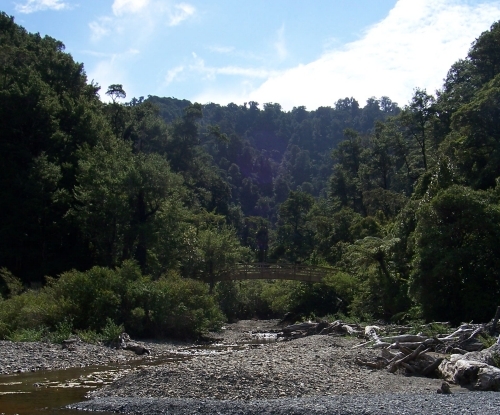 The Bridge over the Turere Stream at the Northern end of the Orongorongo Track is viewed here from the Orongorongo River bed. It is a popular destination - or staging point - for the majority of visitors to the Remutaka Forest Park. Most of the tracks in the Park converge on this area. The steep climb up "Jacob's Ladder" for the return-trip to the Catchpool car park (or the McKerrow Track), commences at the left-hand side of the bridge shown here. On the right (but not visible in this photograph) are clean and well-maintained toilets.